A man who stalked a beauty queen has been jailed and handed an indefinite restraining order. Jonathan Deal, 39, admitted a charge of harassing former Miss Dorset, Samantha Bumford, 25, when he appeared at Poole Magistrates' Court. Dorset Police said he attended public events at which she was appearing, including the Miss England finals where he tried to grab and kiss her. He was jailed for 23 weeks and ordered not to contact Miss Bumford in future. Det Con Neil Causebrook said Deal, of Queens Park Gardens in Bournemouth, had become "obsessed and fixated" with Miss Bumford who won the Miss Dorset competition in 2017 as well as the Miss England Social Media title. "His behaviour escalated over a very short period of time. He stalked and harassed her and caused her a great deal of concern and distress," he said. 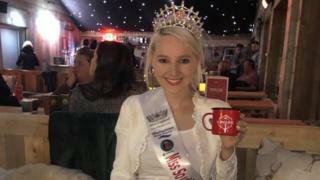 Deal initially sent Miss Bumford a Facebook friend request in August 2018 after she had posted an appeal for support in her efforts to win the Miss England title. He posted a message on social media saying he was "in love" with her. He later tried to gain access to an event she was attending as part of the Bournemouth Air Festival and again at the Miss England finals in Nottinghamshire on 4 September where she forcibly pushed him away when he grabbed her as she came off stage. Deal also approached her as she walked to work a week later, after which Miss Bumford reported him to the police.